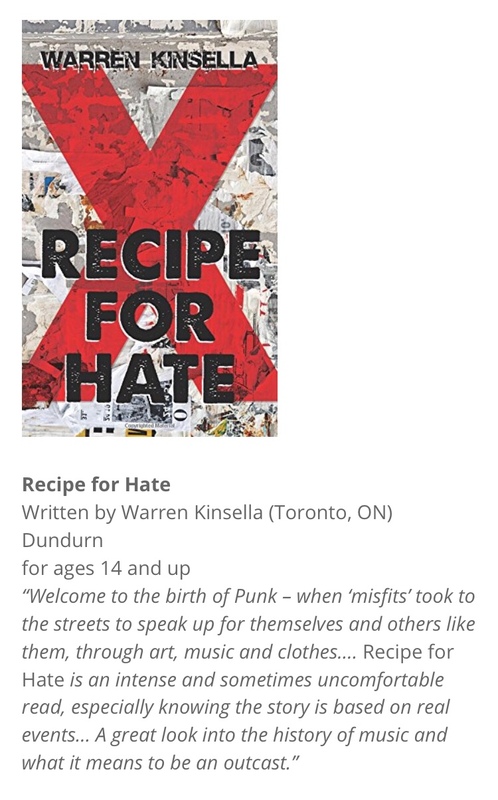 Recipe for Hate is a finalist in a national literature contest! Wow. Gala is at the end of October. Pretty cool. Permission to hijack your post? First Nations are taking a beating on Huffpo today by the usual racist bigoted goobers. One went on about .. welfare, taxes and assimilation and Warren I lost it. This is what I wrote. No need to publish. Not that you would if you didn’t want to but I wanted to share. …….my reply to one Henri Chef. All taxes are monies created from resource extraction. It only comes from four places. You grow it. On farms. The most important is the last one. Those who grow our food. Next comes the trucker who drives the resources to market. 80% of all those people do not live in cities. ergo.. we who do live in cities are nothing more than managers of the world’s largest stolen property department. Now imagine this taxpayer guy Henri Chef. The farmers and the truck drivers gets fed up and decide to stop the only important work that ever gets done and join up and deny service. The world as you know it ends in less than oh, I don’t know, let’s give it three days. In that time you and everyone you know will be cutting each other’s throats for a loaf of bread. The farmers and the truckers and the miners and the loggers and the fisher people will be just fine. They don’t need you or your accountants or your governments or your entertainment or your pundits or your propaganda or your BMW cars or your prada or your gucci or your stupid greedy politicians. Oh, I know. You’ll send out the police and army to force them to do your bidding? You think the guys with the guns will do what they are told when they run out of food? Good luck with that. This is not a reply to your stupid comment. It’s a prediction and it’s coming to a theater near you very soon.